Hey readers! Hope you’re all doing well (as well as you can be in this exhausting heat!) 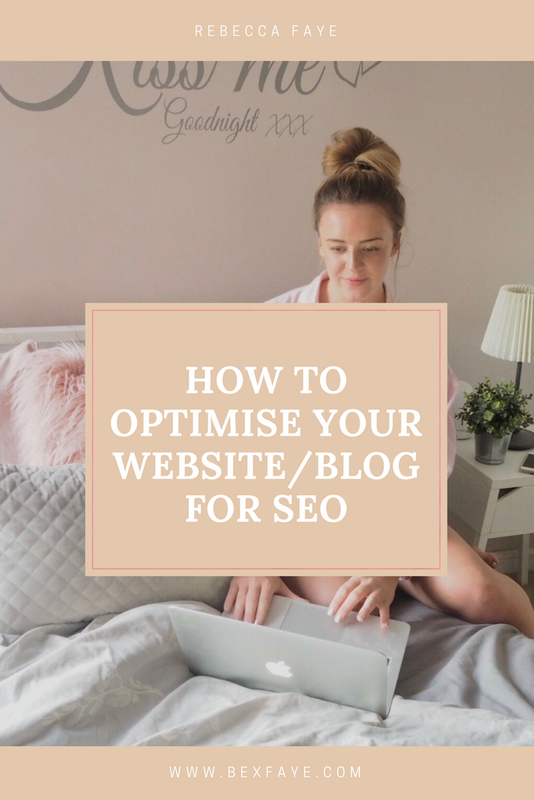 Anyway, I wanted to share my tips on how to improve and optimise your website/blog so that Google chooses your post to rank higher than others in the search engine! How you ask me? Well if you’re interested to know more, then deffo read on. These are some of the key points I’ve learnt since working as an SEO and Content Exec, and I can’t wait to share them with you….. So you may have read lots of articles on how to improve your SEO, or you may not have, but it’s always good to start with talking about what it is. So, it stands for Search Engine Optimisation. In basic terms, it means optimising your website or blog so that search engines (ie Google) can crawl your site, look for relevant information and rank your page in relation to keywords. So for example if you search for something like ‘How to start a blog’ Google will present you with pages and pages of results but it’s the links in the first page that have ranked the highest – and you guessed it, it’s because they have optimised the page for SEO and Google has noticed their relevancy and usefulness so therefore has ranked them high. It’s important to know that there are 1000’s of ranking factors that Google uses to decide who gets the ‘top spot’ rank ‘0’ if you like, and although it’s unlikely you’ll look at every single ranking factor, you can definitely tackle the key factors that are easy to understand and implement. Also, if you’re expecting to see results after you implement these changes straight away then prepare to be disappointed. Results won’t start showing until a few weeks-months after you’ve done anything because Google has to crawl the site and that takes time, so SEO results are not quick by all means, but they’re 100% worth it! Also, to throw a spanner in the works, Google’s algorithm changes daily, so it’s so important you keep on track with any SEO updates so you are always on top of your game! SEO is affected by on site content (things like the title of the page, the headings, internal linking etc) and also off site content (gaining backlinks from reliable websites, infographics, quizzes etc) more to follow on each of these. But basically, SEO is affected by not only what is on your site and the quality of content, but also content thats external that links to your site as well. When you come to write a new post or publish a new page, the first thing you need to think about when it comes to SEO is what keyword you want that page to be ranking for, for example my review on GWA eyeshadow palettes, I wanted to rank for the keyword term ‘gwa makeup’ so my aim was to incorporate this keyword term in my post as much as possible (more on this in a minute). So to do this, you should base your chosen keyword on a) is it relevant and b) is there search volume around it (ie are people searching for this term) and if the competition is low. Ideally you want to choose a keyword/ keyword phrase that has a high search volume and has low-medium competition (although this is sometimes hard). To do some keyword research and to look into this kind of information, you can use tools to help you. I use something called keyword planner but that, you have to pay for. However, there are free sites like ubersuggest that you can use to find out this info! (super handy and it’s a good place to start). There are two types of keywords, head keywords and long tail keywords. Head keyword are shorter but normally have a higher search volume because they are commonly searched for. For example the search term ‘wordpress’ is searched for more frequently than something like ‘what is better wordpress or blogger’. What we mean by long tail is that it is a longer term (like a question) and less people search it, BUT these are equally important to include in your content as you pick up the people who are searching these long tail phrases and therefore capture a wider user. So it’s good to explore both head and long tail keywords so you cover all bases. You may not realise it but the URL of your post is a very important factor when google goes to crawl the page. If your url is completely irrelevant to the content on the page then this is a major issue. Your url should include your keyword as this is important when it comes to ranking! The title of your post/page is also called the H1 (standing for heading 1) It’s essentially telling the readers what your pot is about and should definitely include your keyword. The H1 is a very important ranking factor so should be optimised correctly. For example for the purpose of this post, if I am targeting the keyword ‘seo’ then that word needs to be in the title (which you can see it is). Also, it’s good to look at the search volume around your title, to see if people are searching for that term/phrase. This bit of text, although important, doesn’t actually add value to SEO as such. If you think of the meta description as a teaser to your post and a quick glimpse to what you are offering to your audience. If you don’t optimise this then you may not get any clicks at all despite your page ranking, which would be a waste of all your efforts. This needs to short, snappy but informative at the same time and really grasp the eyes of your audience. There is a great tool called SEO mofo that allows you to draft you title tags and meta’s and preview what they would look like in google, so you can see if any text cuts off. If you include too much text google will just present you with…. and cut off your sentence! What to write in the SEO copy? The SEO copy (the text that’s on the page) whether it be a blog post, a bit of product intro of whatever the structure of your page, the SEO copy again is important. It’s important not only from an SEO perspective, but also from a user experience point of view too. The aim for your web page is for people to land on it, and stay on it, by either interacting or reading etc. Therefore, your content is SOOO valuable. Your content needs to be relevant, engaging, easy to read and unique – otherwise your reader may go elsewhere. Your keyword term should be included in this copy systematically, but not too much as Google will see this as ‘keyword stuffing’ where you are purposely including the keyword for the sake of ranking! Be careful with this! Alt Text – this tells google what the image is and therefore adds value to your page and helps rank it, so you need to add something in there that describes what the image is – and providing your image is related to your post, this will help! So I’ve talked about on page SEO, which is working on best practice on your page/website, but there’s also relevancy off site. What I mean by this, is Google ranks pages that have a higher DA (more on this). To get a higher DA, this takes time and quite a bit of work. You mainly get a higher DA through gaining good quality backlinks. So this is where reputable, relevant websites with a high DA themselves link to your site from theirs. Some people will have gained lots of backlinks from random low authority sites and although they think they’ve done the job, they haven’t really achieved much. To get the most out of backlinks, you have to try and get good, trustworthy sites to link to yours. How? Well that’s the tricky part. There are a couple of things you can do to get the ball rolling, like guest posting, or even leaving comments on other peoples blogs as this leaves a link on theirs. But the best way to gain backlinks to to write really great, unique and compelling posts that other people/ sites want to link to because what you have written is valuable! You can check your DA by looking at MOZ, and this site has lots of useful info too! Where to start with implementing best SEO practice? You’re probably thinking, right okay so where do I start. As there are so many things to consider in this topic, I’d start with keeping things as easy as possible and begin with content that you already have (yes that’s right – already published posts). A lot of people will write hundreds of posts and then once they’ve published it and promoted it a bit on their socials, that’s it. The poor post dies a slow death and gets forgot about. So this is where I’d suggest revisiting them. Take a look at your Google Analytics account (if you haven’t set it up, then definitely do) and have a look over the past year or so, or even since you’ve started which posts have had the most page views (remembering to look at organic traffic) and this way you can establish which posts to tackle first. So if you start with your ‘popular posts’ on your website/blog and see how you can optimise them better for Google. Have a loot at your post and look at what keyword or phrase you are trying to rank for. You can use tools such as ahrefs to see what your website and pages currently rank for to give you some sort of indication, however this isn’t a free tool – although there is a free trial. But with the SEO Yoast plugin I mentioned earlier you can insert your ‘target’ keyword’ for it to give you indication as to how you are doing on the post. Then look at the H2’s or if you have any H2’s in your post. If You haven’t, definitely add some in making sure they are relevant and add value. Adding H2’s adds SEO value as well as improving your user experience. As, lets face it, not everyone has time to read through paragraphs and paragraphs of text. But remember to keep up to date with new SEO trends and there are lots of websites out there that will share new, upcoming information so take it on board and learn learn learn! I really hope this was useful, and I apologise for the length, but this is only touching the surface when it comes to SEO! There is so much more out there, but lets face it, I haven’t got the time to write it, and you haven’t got the time to read it haha! Let me know if this was useful 🙂 I’d love to know! I absolutely loved this, thanks so much! I’m fairly new to blogging and find all the SEO and DA lingo hard to get my head round, you’ve written this so well and it’s really straightforward to digest. I feel like I get it more now! Thanks so much. This is such an informative post Bex!! I’ve recently started in a digital marketing role so I know a lot of this already but there’s definitely more I can do with my blog posts. Yoast is such a handy plug in! !